ELECTRIC STAB JACKS ** FIREPLACE ** POLAR PACKAGE! NO HIDDEN FEES ** WWW.RV007.COM ** 1-888-299-8565 Introducing the new Keystone Cougar Half-Ton 27RLS 5th wheel. This RV has (3) slides, a very nice side aisle bathroom, kitchen Island, solid surface counter tops and so much more! This is one more sharp 5th wheel! The 27RLS floor plan has a walk around north to south queen bed in the front with wardrobes on both sides, over head cabinets and a large wardrobe slide on the off door side. Again, it has a very private side aisle bathroom with an adult size shower with built in seat, a skylight, a porcelain foot flush toilet, sink with underneath storage, medicine cabinet and linen closet all in one room! The living area is spacious because of the (2) opposing slide outs. The slide on the off door side has the free standing dinette with (4) chairs towards the rear and the entertainment center towards the front which has a large LED TV and below that, the optional fireplace! It also has an Island kitchen with a stainless steel double sink, high arc pull out sprayer and more cabinets underneath for extra storage. The slide on the door side is a galley slide which has a (3) burner cook top with glass cover, an oven, an overhead microwave oven with an exhaust hood and the double door refer. There&apos;s also a built in hutch on the bathroom wall with solid surface counter tops with built in cabinets! In the rear is the hide-a-bed sleeper sofa which allows you to sleep up to (4) people in this 5th wheel! Here&apos;s a list of options that were ordered on this Keystone Cougar Half Ton 27RLS 5th wheel. It has the "Half Ton 5th wheel Anniversary" Package, the "Half Ton Comfort" Package, "Camping in Style" Package, and the Polar Package for cold weather camping! All these packages are LOADED with features such as the heated and enclosed underbelly, 15K A/C, 8 cu ft. refrigerator, under mount sink with the upgraded Chef&apos;s faucet, LED interior & exterior lighting, fiberglass front cap, the folding exterior bike/cargo rack with 225lb capacity, and so much more! We also ordered this unit with the power stabilizer jacks, free standing dinette table with (4) chairs and the electric fireplace!! If you have any questions at all, please give us a call at 888-299-8565 and ask for sales. 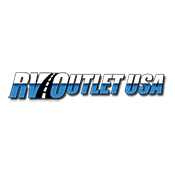 You can email us at rvoutletusa(at)yahoo and our direct website is rv007(dot)com. Please keep in mind we have great financing and we offer HUGE discounts to our customers on 5th wheel hitches and instillation, parts and accessories.